By Chris Williams: With Manny Pacquiao’s defamation lawsuit against Floyd Mayweather Jr. reaching a settlement this week, it was thought that this would be one of the few remaining hurdles removed for a mega fight between Pacquiao and Mayweather. However, Michael Koncz, Pacquiao’s personal adviser, has his doubts whether this will put Mayweather in the mood to fight Pacquiao now. I can understand how it wouldn’t exactly make Mayweather feel. How would you feel if you had to pay a settlement and then give a statement afterwards about it? I think a lot of people might still harbor some resentment with the settlement and the statement. I can see how it might not be an issue for Pacquiao, because it looks like he got what he wanted. But for Mayweather, it could be a sore issue with him and I can understand that. This isn’t the best way to go about putting a fight together if someone just went through what Mayweather did. We might be waiting a long, long time for the Mayweather-Pacquiao fight to happen after this. I hope Bob Arum can expand his Top Rank stable of fighters because he might need to in order to keep Pacquiao busy. Boxing fans don’t want to see Pacquiao fighting Juan Manuel Marquez for a 5th, 6th, 7th and 8th time simply because Arum doesn’t have any other fighters to put Pacquiao in with. I think this whole lawsuit thing has really worked against Pacquiao in trying to land the Mayweather Jr. fight because it’s hardly the way you go about trying to get a fight with someone as talented as Mayweather. It’s something that would work against a fight. Let’s just pretend that a Mayweather-Pacquiao fight was made. How would Mayweather honestly be able to hype a fight with Pacquiao if he’s worried about being sued for everything he says? Mayweather might effectively be muzzled during the entire 24/7 series, afraid to say something that might cause Pacquiao to take offense and start up another lawsuit. Trash talking is something that Mayweather does quite well and he uses it in order to get the boxing public excited about a fight. But if he can’t feel comfortable doing it for fear that it’s going to cause a chain reaction leading to a lawsuit, then I can see him not even wanting to take the fight. It wouldn’t be a big deal if Mayweather got such a huge cut of the revenue that it would cover any lawsuits that came about during the hyping of the fight, but what good is that? 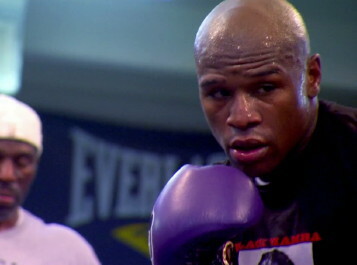 Mayweather might just break even if he’s sued 24/7 every time he opens his mouth and talks trash. Koncz is right, though, about Mayweather possibly not feeling better even though the litigation is done. How could Mayweather feel good if he had to settle? I know how some boxing fans feel that Mayweather should use this to want to get Pacquiao back by beating him up in the ring. But Mayweather may not feel that way. He could be looking at it a different way entirely, like he might want anything to do with Pacquiao and his promoter because of this. After all, Mayweather would be helping Pacquiao by agreeing to fight him and he’d be helping Pacquiao’s promoter as well. Even if Mayweather beat Pacquiao, he’d still have helped him a great deal by giving him a huge payday.